Sited at the confluence of social and cultural motivations, this project aerates the museum. It infuses communal spaces between the irreducible components of the museum. In doing so, a symbiotic relationship between the community and tourism develops. Careful programmatic overlaps occur to cultivate this relationship while maintaining museum security. This project is two buildings woven into each other. gatherings produce both particular and ambiguous functions. These functions include the required café and restaurant, but also saunas and other spaces that foster as a variety of different social gathering spaces-- weddings, meetings, ceremonies, etc. While the museum acts as a beacon for tourism, the social spaces serve the local population in a productive manner. This proposal is a confluence of cultural and social drivers. It serves as a communal linchpin for Helsinki while enticing tourism on the waterfront. 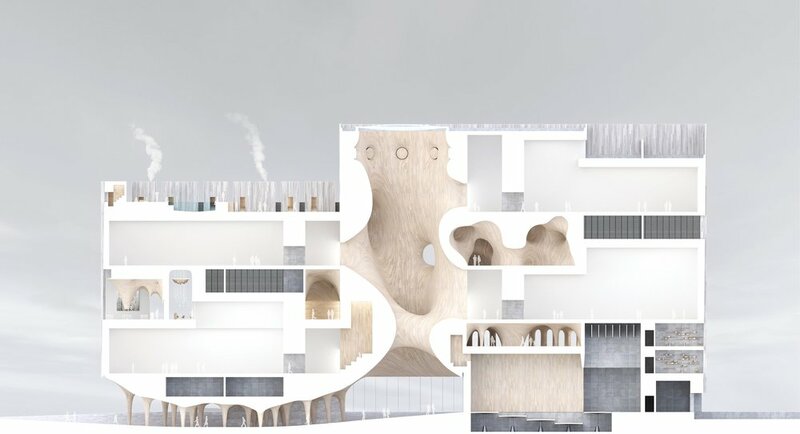 This proposal is simultaneously a Guggenheim museum and the future community center for Helsinki.